6 chambres: K * Q * D, S * D, S * * 2S 2S. Maître de haut en bas. Lave-vaisselle, laveuse / sécheuse haut et en bas, 3 câbles d'une télévision à 2 écrans plats, internet haute vitesse sans fil, 2ème salon zone en bas, avec bar et 2e réfrigérateur. Terrasse couverte avec rockers et table de pique-nique. Douche extérieure. Zone en bas, est accessible aux personnes handicapées (non approuvé ADA). Excellente vue sur l'océan et l'accès facile à la plage. Disponible toute l'année. Pas d'animaux. La maison a une nouvelle terrasse, nouvelle peinture fraîche et nous avons ajouté de nouveaux planchers de bois franc dans tous les espaces de vie. Perfect for our large family with 6 little kids. 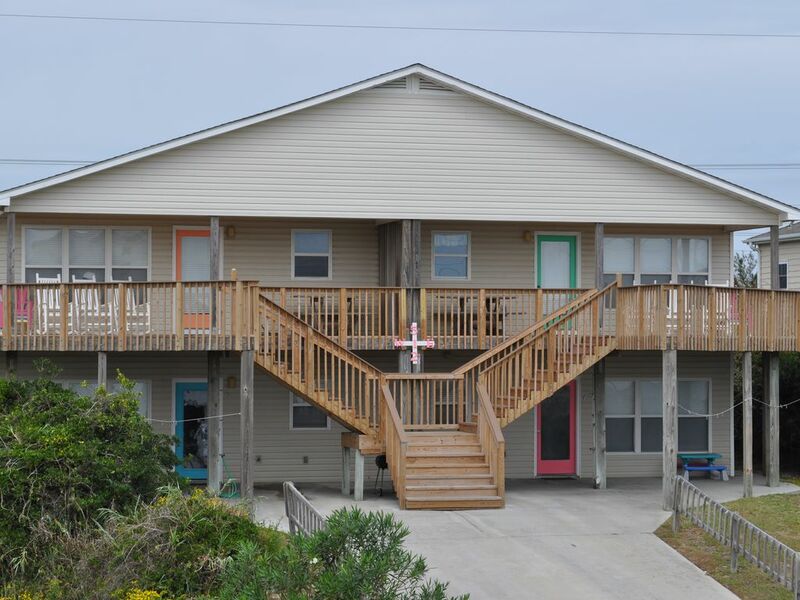 Great location, great property.everything you need for a great stay at the beach. As our group continues grow, I can foresee a time in the future that we could rent both sides. Owner is great to work with. Entire process could not have been any easier. Sunday to Sunday was perfect for us. Thanks so much for reviewing us! We are still under construction from Florence, but we are working hard to get ready for next season! Hope you will come back and see the new and improved duplex! Very good property! Good impression with recent improvements. Have used the property for years! Thanks very much for reviewing us! We are very appreciative of our loyal families returning year after year. We will continue to make improvements during the off season. This year was new carpet in the bedrooms and last year was new countertops in the kitchen. Thanks again for taking the time to review. I've got your week reserved for 2019. Pleasant property with comfortable beds and lots of kitchens immentites. Our family really enjoyed our stay at this property and the close proximity to the the beach. Some traffic noice on back of the house due to close proximity to main road. Beds were very comfortable but linen rentals didn’t not fit well on beds due to thick mattresses and sheets not made with deep pockets. Only had a few issues but property owner had plumber and electrician there quickly. I will pass on your feedback to our Linen Service. We do have all new mattresses in the house, so I want the sheets to fit properly. I try to address maintenance issues as soon as possible, so thank you for letting me know. I've had guests in the past that don't let me know until after they leave the house. Thanks again and I hope you'll come back to Stewart East and West! We have stayed at this property numerous times... even on the second row it has good ocean views and is located near beach access. When you rent both sides of the duplex for a large family, you not only get the bedrooms but also 8 bathrooms and four large living areas. The owners are top notch and make staying their easy; they are quick to address any problems that arise (which is seldom). We are so grateful to have families like yours that return to Stewart East/West year after year. Our home is your home. And it's comforting to know that you treat the house as if it's your own. I love the view from the upstairs deck and I hope you got the opportunity to just sit and relax while gazing at that beautiful ocean. We look forward to having you back next year and many years after that. Perfect for Our Wedding Weekend! We had a large group (25 adults and 4 children) in both sides of the duplex (Stewart East and West), and it was PERFECT! The pictures really do not do the place justice. The interior is very nice, clean, and well taken care of. All of our guests slept comfortably, and the kitchen was well stocked with appliances and dishes. The upstairs deck was hands down our favorite part - just step out there morning or night and you feel like you're on the beach! We will never forget our stay! Thanks SO MUCH for taking the time to review us! We have hosted many family reunions and church groups, but we have only had a couple of wedding families stay in the past. I'm glad to hear the house suited your families. Renting both sides really gives everyone a lot of room to spread out (which can be necessary if staying for an entire week)! Thanks again for your review and I hope you'll visit us again! Great family getaway with easy access to the beach. Great property! Enjoyed the amenities of home. Great for large family celebrations. Would stay there again. And also THANK YOU for taking such good care of the house. My Cleaning/Linen Service, TAPS, passed on how great the house looked when she arrived to clean. She is quite picky, so if she said it looked good; then it must have been very good! So thank you, again. Even though the house isn't Ocean Front, the beach access is almost directly across from the house. It's hard to see in the photos, just how close it is. We hope you will come back to see us very soon!